1. As the blade is extremely sharp, please do not touch it directly. 2. Please guarantee that your blade is locked securely before use. 3. Keep the tool stay away from children and under 16 years of age, who need to under adult supervision. 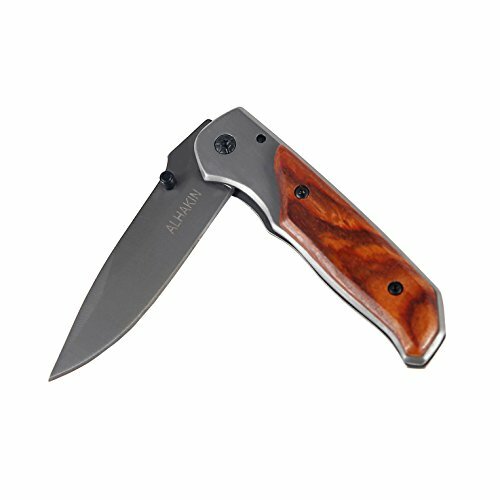 Wood Handle - Offers anti-skid and good-grip feeling; Back clip design is easy to carry. Liner Lock Design - Safe to use, locks the blade in place, avoid risk to be hurt by the accidental close of the blade. Steel Blade - Made of high quality steel with sharp edge, which ensures the hardness, sharpness and durable quality. Rust Protection - The blade with gray titanium coating, can prevent it from rusting even in severe conditions, and perfect for outdoor use. Package Content - Wood Pocket Knife; Black Velvet Bag; Black Package Box. View More In Knives, Axes & Saws. If you have any questions about this product by ALHAKIN, contact us by completing and submitting the form below. If you are looking for a specif part number, please include it with your message.